It is widely, though not unanimously accepted that General Jurisprudence is a branch of metanormative theory. David Enoch has recently argued that, compared to metaethics, General Jurisprudence is not interesting. The reason, according to Enoch, is that whereas morality is full-bloodedly normative, the law is only formally normative. A system of norms is full-bloodedly normative when it provides – as a matter of necessity – real or sans phrase reasons for action. Given that morality's normativity provides real or sans phrase reasons for action, it is full-blooded, which renders metaethics interesting. The law, instead, provides no real reasons for action, at least not necessarily – the law only gives, as a matter of necessity, legal reasons; it only provides legal criteria of correctness. To put in a provocative way: From a philosophical standpoint (though not from a social or political one) law's normativity is as interesting as etiquette's normativity. General Jurisprudence, Enoch suggests, should give up the metanormative approach to the law. Legal philosophy, as Julie Dickson put it a few years ago, seems to be in a perpetual identity crisis. Enoch's claim could be interpreted as the latest expression of this identity crisis. This special issue seeks to clarify whether General Jurisprudence should insist on its metanormative approach to the law or, alternatively, should start pursuing other aims, such as doing straight normative theory, as Enoch himself and Scott Hershowitz have recently concluded. To get engaged with Enoch's arguments against General Jurisprudence understood as a metanormative enterprise. 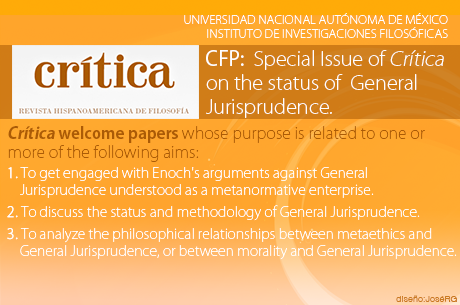 To discuss the status and methodology of General Jurisprudence. To analyze the philosophical relationships between metaethics and General Jurisprudence, or between morality and General Jurisprudence. We welcome submissions of papers addressing these matters. Papers should not exceed 10,000 words and are to be submitted (PDF or Word) as an email attachment to the contact people below by January 31st 2017.